Acquisitions can quantum leap growth. Acquisitions allow a transformation of scale. They can accelerate the execution of a great strategy, but they require a process to ensure success.Remember—acquisition is not a strategy. Acquisition is a tactical technique to achieve a well thought through strategy. First, define your unique market. Then use various techniques to dominate. Buy what you want to buy, not what is up for sale. The Portfolio Partnership offers a range of acquisition support services depending on the size of your team. We can perform the role of Corporate Development Director to drive your acquisition strategy. Or we can focus on certain aspects of the process where you feel exposed. The key to our success is our Acquirer’s Playbook – a tried and trusted methodology that has been translated into a process map we call The Acquisitions Approvals Model. 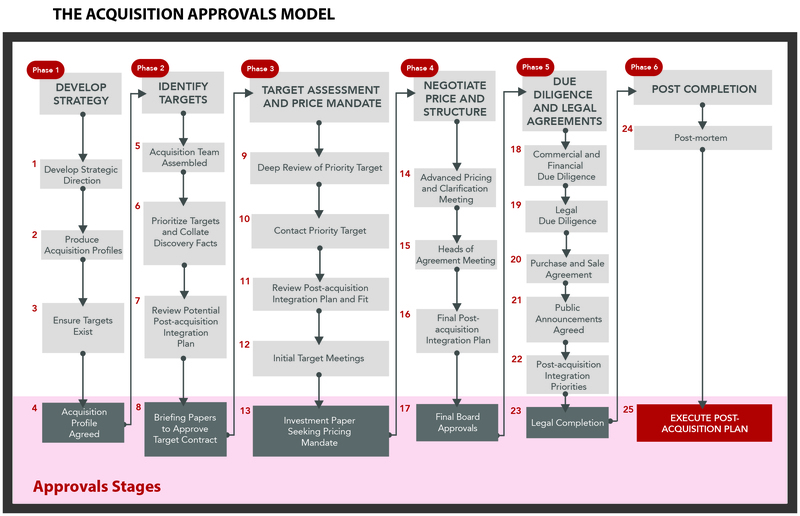 This is the process map we love to embed in our client’s business whether you are doing one deal or 20 deals per year. By using a tried and tested process we ensure that the team doesn’t miss things. We add experience and know-how to the talent and resources that already exist in your organization. We change the odds in your favor by finding answers key questions. 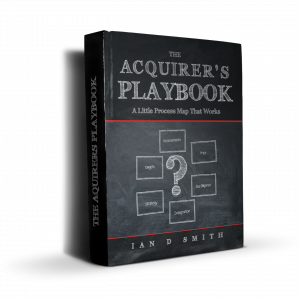 Read the details in our new book just published – The Acquirer’s Playbook. We offer training, support and execution to suit the needs of your team. What is the best strategic direction for your business? Can you execute this strategy partly by acquisitions? What are the ideal characteristics of an acquisition target? What resources do I need to execute an acquisition strategy successfully? For any given specific target what is my post-acquisition integration strategy? What are the key facts and figures related to my priority target? What is the best way of contacting the owners of my priority target? What questions should I ask the owners of my target company in the first few meetings? What value and deal structure makes sense for my priority target? How do I achieve approval from my shareholders to negotiate a deal and at what price? How do I ensure I don’t overpay for the deal? How do I continue to validate my post-acquisition strategy during ongoing negotiations? How do I manage a Letter of Intent Meeting? How do I project manage commercial, financial and legal due diligence? How do I validate my post-acquisition plan during due diligence? How do I manage my legal team to ensure the Purchase and Sale Agreement captures all elements of the deal? How do I handle the target’s key customers, key staff and stakeholders? What do I say to my own employees? How do I prioritize the integration of all operational needs of the target once I own it? How can I learn from successive acquisitions? Is your acquisition process working for you? Give us a call on 978 395 1155 to review your process.